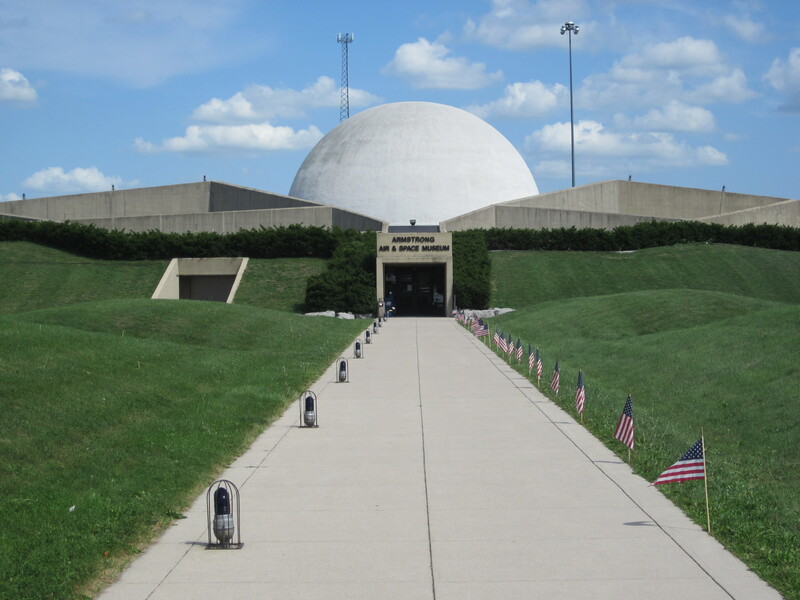 On July 19th and 20th the Armstrong Air & Space museum in the small town of Wapakoneta, Ohio put on the Summer Moon Festival celebrating the 45th anniversary of the first lunar landing. Chad the girls and I met up with my friend Erin and her daughter and made the trip. It took us about and hour and a half to get there so we made sure to stop to eat lunch before we went over. There were plenty of places to eat and you could see the Astro Theater from the road! We couldn’t miss it ! Dad of two peas made a friend…. Two Peas plus one ….who is tall enough to go to space??? The girls had a fun scavenger hunt to do for the Festival, they loved reading about everything to searching for the answers. Erin and Dylan the most! The could do a scavenger hunt every where they go….Challenge accepted! You have to check everything out…but sorry Py you can’t go through that door…. Mr. Armstrong’s Apollo 11 suit! Hey are you allowed to touch that?? Something in there must have been shocking! The walk way to the Astro Theater was beautiful, Phoebe called the theater the moon room AHHHHMAZING ! The photographs alone are enough to get you to the museum but learning about them even better. Walking out to the rest of the festival was the wall of all Ohio born Astronauts. That was awesome who knew how many of them were from here! The littlest pea stuck to the inflatables since she was just shy of age to do that moon walk the older girls did. Over the hill from all the inflatables, the jump thing and the rocket launch were the tents with animals, NASA, jugglers, book readings from Ohio authors and crafts. Look at all those tents, just full of fun! NASA was here they showed Py how far you can jump in space! Gave us stickers and some sweet pictures of the Ohio Astronauts and shuttles too! NASA printed out pictures of the girls in space! A book reading by the author Meaghan Fisher. She signed a book for the Phoebes. We met Author David Crawford, and had his book Delta G signed for Uncle Fred, he loves Sci Fi! Mr. Crawford spoke to us for awhile about his book I can’t wait to read it. You can find it on Amazon and Barnes and Noble. Waited patiently for Face Paint…. Round bubbles out of a triangle, yep! Some last minute photo ops! We had a great time and can not wait to go ahead, be sure to check their website for the movie they will be playing when you go or for any special events coming up like this festival! I hope you get a chance to see this year old treasure you are guaranteed to learn something! This entry was posted in Uncategorized and tagged 45th moon landing, Apollo 11, Armstrong Air & Space Museum, family fun, girl scout trip, girl scouts, kids, Museum, NASA, Neil Armstrong, ohio, OhioHistory, patches, space, Summer Moon Festival, Wapakoneta. Bookmark the permalink.